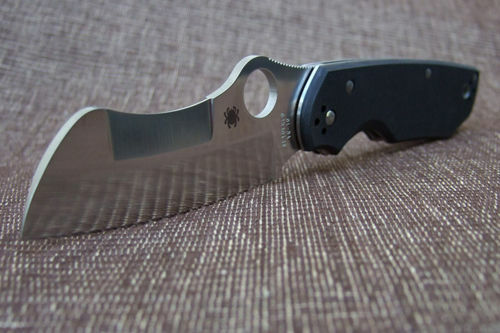 The C139 Jason Breeden Rescue was introduced in 2010 and is Breeden's second collaboration with Spyderco. "Can a fledgling Knifemaker's style be established after just two knives? Jason Breeden's has. He earned distinction as the knife designer who creates odd-shaped blades with the release of his first Spyderco collaboration, The Captain. Although critics initially found the Captain's shape unusual they changed their opinion after using it and experiencing its pure functionality, quickly dismissing its quirky appearance as inconsequential. 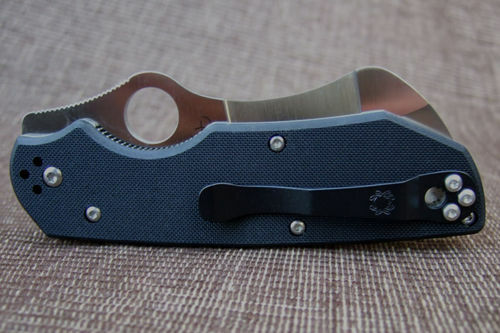 Jason's second collaboration, the Spyderco/Breeden Rescue, is equally unconventional. In keeping with his previous design, it reflects his hard-use outdoor experience in the Appalachian Mountains. The Breeden Rescue has a VG-10 Sheepfoot-looking hollow-ground blade. Focus is placed on strength to the tip of the blade where a knife sees the greatest use (think digging or prying). The end of the blade noticeably bulges outward, its breadth further accentuated by a non-sharpened spine swedge reducing the blade's weight. Black G-10 handle scales house a Walker LinerLock, full skeletonized liners, four-way silhouette pocket clip and piped lanyard hole. Handle is made with screw-together construction. Unique and functional, the Rescue by Jason Breeden makes an impression both visually and functionally." This page was last modified on 14 November 2016, at 02:19.